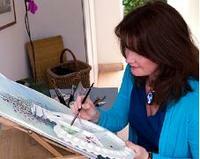 I learnt to paint whilst living in the Far East in the 1960's and it was there that my passion for painting began. I attended the art department in Hong Kong University under an American resident tutor who taught me oil painting for two years. The subjects were mainly landscape, still-life and portraiture as well as seascapes. I also studied Chinese painting with Professor Lau Ta Po for over a year. I gradually started to paint in watercolours and enjoyed the opportunity of being able to paint in both mediums. 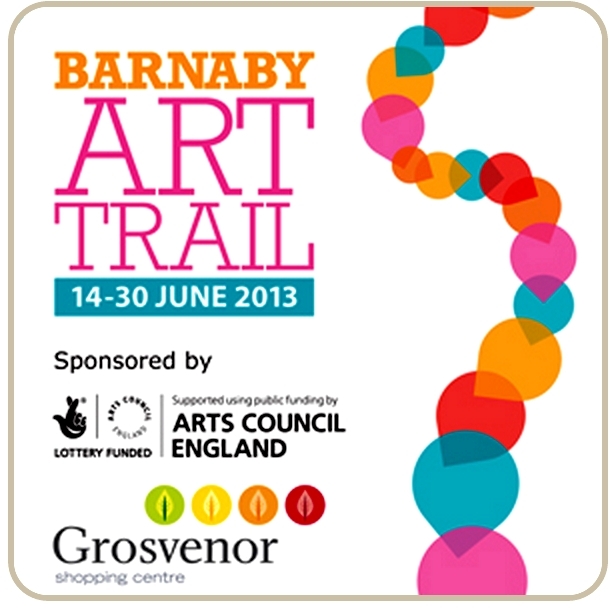 I am a member of The Society of Women Artists and a Member of The Royal Birmingham Society of Artists . I am a qualified Adult Education Teacher and organise workshops, painting days and demonstrations to art groups and societies throughout the country. I have demonstrated at Patchings Art Festival at Calverton in Nottingham and also at the Mall Galleries in London for the Society of Women's Artist's exhibition. "My current work has concentrated on landscape paintings made ‘in situ’ with large houses and gardens providing the theme. I attempt to convey an atmosphere and a sense of mystery about a venue despite it being recognisable to those who know the location. "I like to paint in acrylic on paper, the medium limiting the message at times but liberating it at others. The intention is to balance a careful design element with wilder, more gestured passages." 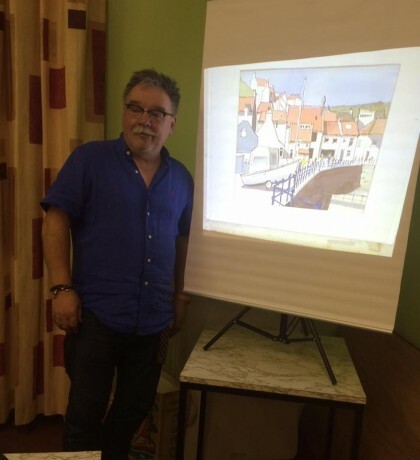 ​Anthony is a member of NAPA the National Acrylic Painters Association and has been painting for over 30 years he holds a BA (Hons) Fine Art and Certificate in Education and is a professional artist and lecturer and a Member of the Institute for Learning. “I would say that when I begin a piece of work, my aim is not one of total realism, but more of an individual, slightly abstracted feel, which I achieve by fragmenting the image into shapes that echo certain elements in the image and then the painting, in a way takes over and dictates to me how it wants to progress. I find this way of working really exciting and enjoyable. 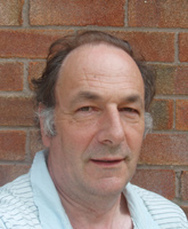 "Hello – my name’s John – John Harrison – Yorkshire born and bred, and proud of it. My home county, especially the wonderful town and villages along its East coast, is the inspiration for much of my recent work, seen and drawn with a different view of familiar places. "The pen and ink style of all this childhood reading influenced me to a greater extent than I realised – after trying out most other media,I have come full circle and for the last few years have worked almost exclusively in a line and wash style. It feels the most natural thing in the world to me, and I hope that feeling comes through in my work. "I’ve been involved in creative endeavours of one form or another for most of my adult life: I had a long period where I earned my living as a professional drummer, and sketched and drew constantly: sadly, I no longer have those sketchbooks, which I’m sure, contained many illustrations I’d be proud to show. ​"A graphic designer with a real passion for typography, I love using ink and watercolour wash, with buildings, townscapes and coastal scenes my favourite subject matter. See Stephen demonstrate his methods painting a lively, loose portrait in oils. Stephen is a well known portrait artist, best known for his life scale, naturalistic portraits. 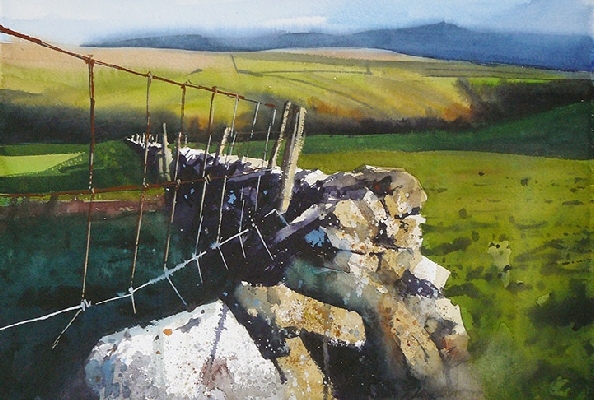 You can view some of his work at artuk.org. Jeremy will be painting a landscape in wet into wet oil technique, a bit like watercolour in the early stages. Manchester artist Brenda Chapell will be demonstrating the use of a wide range of the well-known Caran d'Ache products including watercolour pencils, pencil crayons and gouache as well as exciting new products. This promises to be an entertaining as well as instructive and informative evening so please arrive in plenty of time so that the demonstration can begin at 7:00 prompt - there will be a lot to fit in! Please note that there will be no merchandise available, however there will be brochures and details of stockists of all the products demonstrated. All Saints Church Hall, Brough Street West, Macclesfield. Everyone welcome - bring a friend. 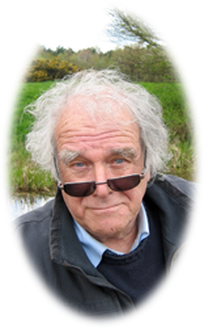 Paul Talbot-Greaves is a prolific landscape painter and writer from the North of England. We welcome Nick back to show us more of his techniques with acrylics. Nick is planning a demonstration using acrylics to try to depict the effect of a meadow garden, with their small points of bright colour in amongst the 'feathery' grass. He will use a number of loose techniques such as dripping and flicking the paint, and using 'polyfiller' to make some things stand out. 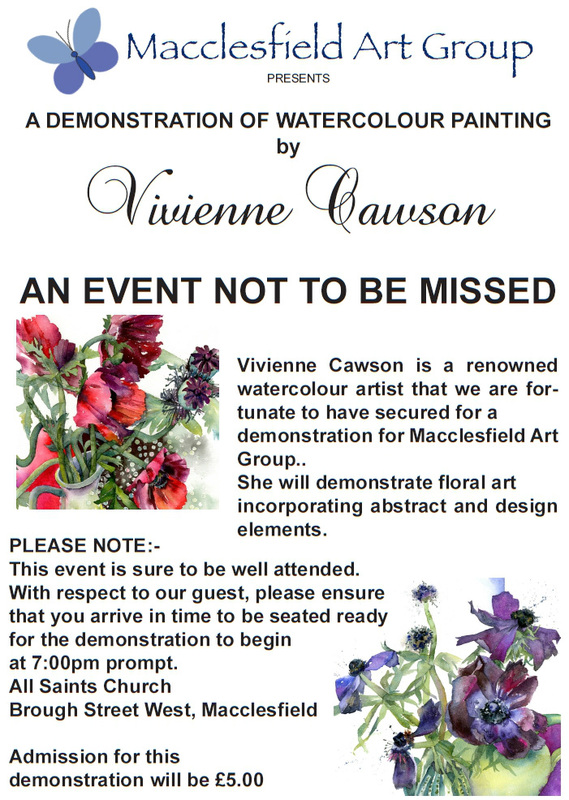 A ‘must see’ event for anyone interested in watercolour painting, particularly if you enjoy floral art. Bring a friend - The demonstration is open to all and admission is the usual £3.00. As this is sure to be well attended, please be sure to arrive in time to be seated ready for the start of the demonstration at 7:00pm. "Drawing, painting and sketching is all about enjoying what you are doing. Hence, my subjects tend to be food related! whether it’s some seasonal produce (a freshly picked bunch of beetroots), painting a handsome bullock or baking cupcakes with my little girl. 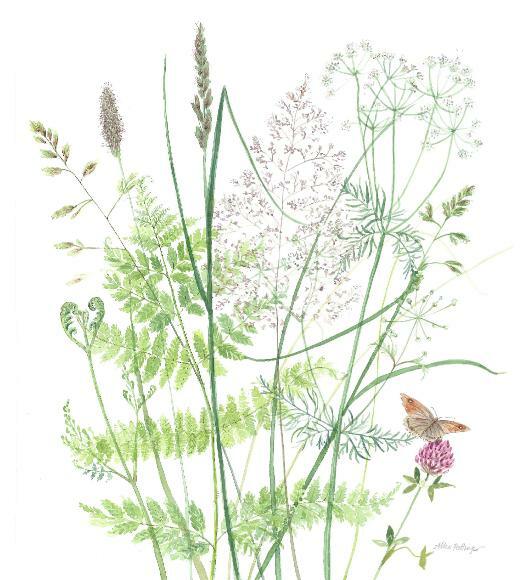 "I also love to paint in a garden; capturing delicate florals and their insects fluttering around them, or sitting on a hillside working on a landscape view. I hope that my paintings are both fluid and lively; I will often bring over a detail with hand written anecdotes." Admission £3.00 includes light refreshment. event is sure to be very well attended. 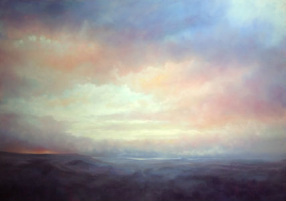 Sandra's studio is in the heart of the Peak District with views of the moors of the Dark Peak to a distant Kinder Scout. A keen walker, she is inspired by seasonal colours, ever-changing light, weather and the atmosphere of not only this landscape but also the striking coastlines of the United Kingdom. A frieze of paintings by Macclesfield Art Group explores the ongoing development of the town, its people and the surrounding countryside. Accompanied by historical facts and stories, the exhibition also includes a sticky wall for visitors to add their own ideas for the changing face of the town and jigsaw copies of the paintings for children. ‘The Urban Landscape’ - a demonstration of painting in acrylics by Nick Eveleigh. 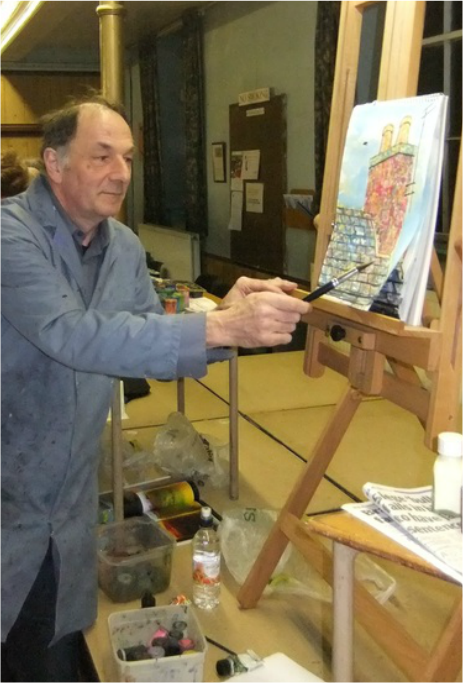 Nick Eveleigh has been painting and teaching art for over 30 years, and now spend time teaching art to adults in schools, colleges and private venues, mainly in the South Cheshire area. He started painting seriously in 1973 when my studies took him to Manchester where he was struck by the atmosphere of the industrial landscape and the colour of the brickwork which is very different to his hometown of Monmouth in South Wales. He prefers the more prozaic, earthy, less fashionable places which we tend to overlook as they offer a more accurate reflection of our society. More recently he has broadened his subjects to include portraits (animal and human! ), still life (natural and man-made), general landscapes and water. We have arranged for Roger to give us a demonstration on November 23rd . Steven Bewsher was born in Manchester in 1964. He graduated from Manchester and Wolverhampton with a BA (Hons) in Fine Art. He held his first exhibition in 1994 in Manchester. 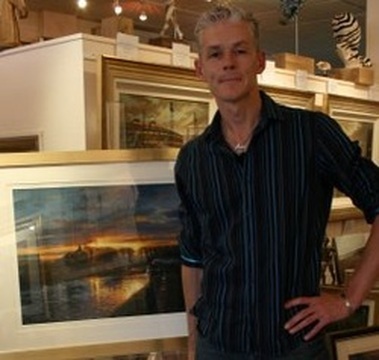 In 1995 Steven exhibited at the Mall Gallery in London after taking part in the Discerning Eye Competition. In the same year he held his first one man show in Knutsford to great acclaim. This led the way for further one man shows in both Buxton and Alderley Edge. Steven’s work concerns the effects of light and shade on the landscape, capturing the changing colours and luminosity of the seasons. A constant theme Steven keeps returning to is the last dramatic glimmer of sunlight on the landscape before it disappears. The rivers and canals of Cheshire have been a constant source of inspiration, the stillness of the water acting as a mirror, reflecting both landscape and the last light of the day. Steven’s work has been featured in ‘The Art Magazine’, and ‘Artist and Illustrator’ and he has contributed to several tuition books. 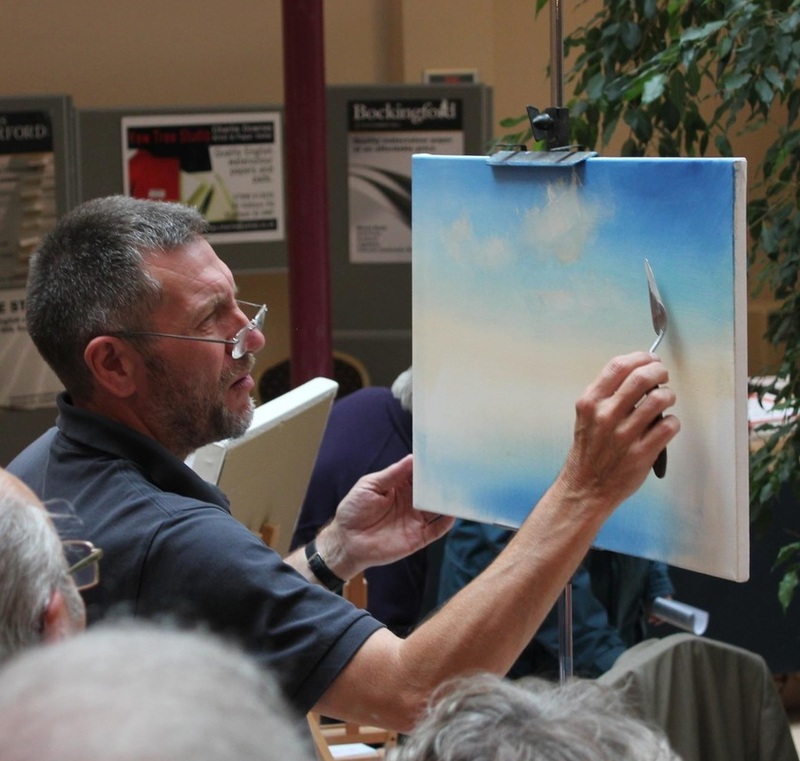 He is also in demand as a demonstrator of painting to art societies around the country. His work has been reproduced as both limited edition prints and greetings cards.